Mike Branchflower, Kongsberg Digital and Jørn Kjølaas, SINTEF, Norway, explain how improvements to an advanced transient multiphase flow simulator enable improved designs of natural gas pipelines with low liquid loading. With the development of new technologies, it is now possible to more accurately predict pressure drop and liquid content in natural gas pipelines with low liquid loading, along with what is often referred to as the ‘liquid accumulation point’. The KONGSBERG LedaFlow® advanced transient multiphase flow simulator is an example. The liquid accumulation point is the level of gas flow where liquid content increases by orders of magnitude; it is important to know at what gas velocity this will occur to correctly size pipelines and receiving facilities. Failure to understand this can result in reduced well productivity due to the increased pressure drop in the pipeline, unstable flow, and flooding of the receiving facilities. Figure 1. Liquid accumulation point. What is the liquid accumulation point? When natural gas is produced from a reservoir it is common for liquids to be formed due to the reduction in pressure and temperature that occurs as the fluid flows from the reservoir into the well, through the wellbore and along the pipeline. This liquid is referred to as condensate, which may in turn contain water. The ratio of the liquid mass flow rate to the gas mass flow rate in the system is referred to as the liquid load and when this is low it can be very difficult to accurately predict the liquid content in the pipeline. In particular, it is challenging to predict the gas flow rate at which there is a dramatic increase in the liquid content, which is referred to as the liquid accumulation point. Figure 1 shows the sharp increase in the liquid content at the liquid accumulation point, which leads to unstable flow and an increased pressure drop. It is undesirable to operate in the region with a high liquid fraction as it can reduce the productivity of the wells due to the increased pressure drop in the pipeline and cause flooding of the receiving facilities. Figure 2. 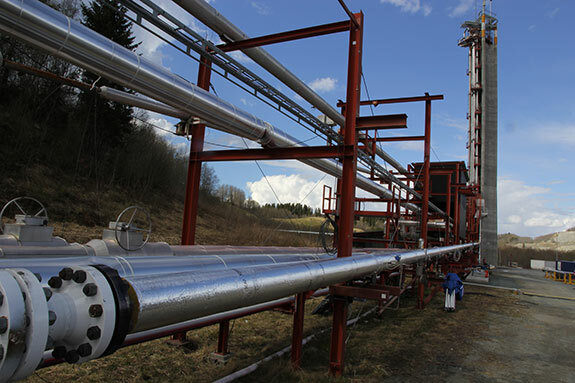 Oil and gas operator funded experiments at the SINTEF Multiphase laboratory. In 2013 and 2014, a global oil and gas operator financed a comprehensive experimental campaign at the SINTEF Multiphase laboratory to support a deepwater gas development offshore Tanzania. The gas field is located at a depth of 2600 m about 100 km from the mainland, and the produced fluids will be tied back to an onshore LNG facility. One of the main challenges is that the seabed topography is characterised by large scale canyons and channels, which can lead to major flow assurance challenges if the 100 km long multiphase transport system is not designed correctly. The aim of the experiments was to produce large scale data that could be used to improve multiphase flow models with respect to the prediction of liquid accumulation so the best possible design decisions could be made for the Tanzania field and other gas dominated production systems. In the new experiments, gas, oil and water were injected into a 94 m long pipe, and the oil/water rates coming out of the pipe were measured in order to detect possible liquid accumulation. With this novel experimental technique, it was possible to map out the flow conditions for which liquid accumulation occurs. The experiments were conducted at high pressure (60 bara) with 8 in. and 12 in. pipes, covering inclination angles of 1°, 2.5° and 5°. Also, several types of liquids were tested in order to study the effect of liquid density, viscosity and surface tension. The experimental campaign produced large amounts of data that were highly relevant for multiphase flow in low liquid loading conditions, in particular for the Tanzania field, and providing material for seven scientific articles. Figure 3. SINTEF large scale multiphase laboratory. Data from the experimental campaign described above was made available to LedaFlow Technologies, DA (LTDA). Based on the measurements performed in the SINTEF experimental campaign, the physical models inside the advanced transient multiphase flow simulator were improved considerably. Specifically, the new data made it possible to calculate the shear stress between the gas and the liquid film with unprecedented precision. This enabled the development of a much more accurate model for the gas-liquid shear stress which is critical for low liquid loading flows. In addition, the droplet entrainment model which predicts how much of the liquid is transported in the form of droplets, was improved using the new measurements. With these improvements in place, the simulator was found to predict the onset of liquid accumulation with remarkable accuracy. These model improvements were included in LedaFlow 2.0 released on the 21 March 2016. There are an increasing number of natural gas projects that have large diameter, long distance pipelines with low liquid loading so these improvements are timely. This new version of the simulator is expected to have a significant impact not only on the design of new natural gas pipelines with low liquid loading, but also on the operation of existing natural gas pipelines with low liquid loading. This is due to the improvement in the model accuracy leading to reduced uncertainty and design margins. LedaFlow now predicts these pipelines can be operated at a lower gas flow rate than previously thought. This means that gas fields can be produced for longer before they enter the high liquid content region. The use of expensive boosting techniques such as subsea or onshore compression to extend field life can also be delayed which results in improved project economics. In addition, gas fields that were previously thought to be unprofitable might now be economical to develop. The LedaFlow project was established in 2002 by ConocoPhillips, Total and SINTEF. 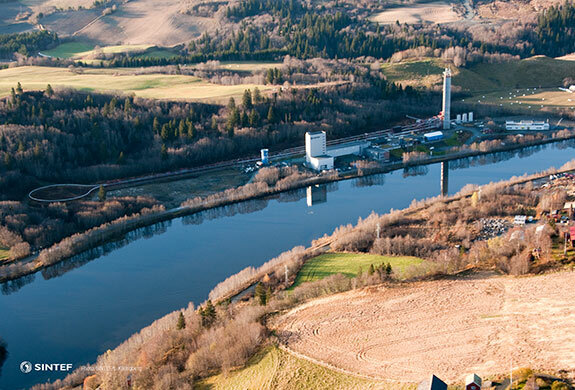 KONGSBERG was selected as the commercialisation partner in 2008. LedaFlow is a 1D transient multiphase flow simulator based on models that are closer to the actual physics of multiphase flow. It provides a step change in accuracy and detail over other tools as each of the nine fields (continuous and dispersed) has its own mass equation. The energy equations are solved for each continuous phase including both unit cell and slug capturing models. The first commercial release was in 2011 and the latest release, version 2.0, offers wax and hydrate modelling in addition to core model improvements relevant for low liquid loading in near-horizontal and vertical flows. The SINTEF Multiphase laboratory in Trondheim, Norway was built by Esso in 1983 as fulfillment of the Norwegian Technology Agreement, which stated that at least half of the research associated with Norwegian continental shelf field developments had to be done in Norway. The purpose of the laboratory was to produce industrially relevant multiphase flow data in long large-diameter pipes, for developing flow simulation software for the oil and gas industry. With its 1000 m long 8 in. flow loop, it remains today the world’s largest flow laboratory. The laboratory was taken over by SINTEF in 1984, and has since become a key success factor in the development of multiphase flow technology, which has been a crucial element in the advancement of safe and cost-effective petroleum production. In particular, this technology enabled transport of unprocessed well stream fluids, thereby reducing/eliminating the need for platforms. This has lead to great savings in expenditure and an increase in profitability of offshore fields. Since the birth of the SINTEF Multiphase laboratory over 30 years ago, a large number of experimental projects have been executed, producing a large multiphase flow database. In recent years, much of the research at the laboratory has been dedicated to the continuous development and improvement of the LedaFlow advanced transient multiphase flow simulator.